(RNS) — I’ll never forget the first time I visited Tennessee’s death row. On my way to visit the men in Unit 2 at the Riverbend Maximum Security Institution in Nashville, I bumped into the state’s Gov. Bill Haslam. As it happened, I had just come from a conference where he had shared about how his Christian faith shapes his political convictions. I told the governor that I was praying for him and hoped no one would be executed under his leadership. Then I headed to Riverbend. As I met with about a dozen of the men on death row, I mentioned that I had just talked with the governor. It occurred to me that they might have some things to say to him. After a moment of silence, one of the men spoke up. It was a genuine request from one Christian to another to come join them in prayer and recognize their humanity. Since then, I’ve tried to invite Gov. Haslam nearly every time I’ve gone to Riverbend, and I’m still hoping he will take them up on the offer. That moment came back to me this week, as the state of Tennessee plans to execute Edmund Zagorski, using the electric chair. 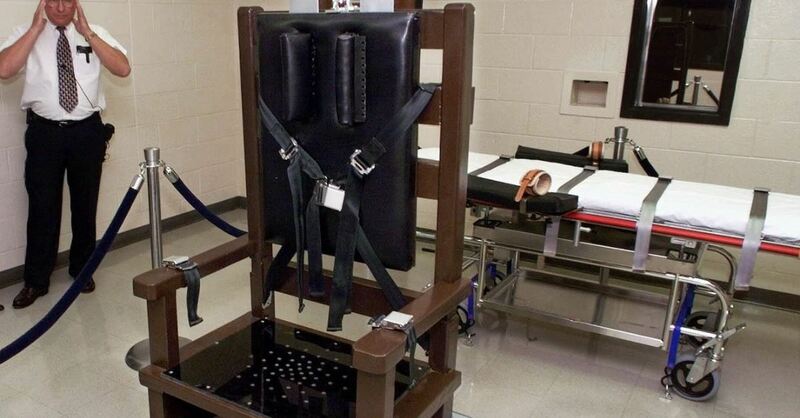 It’s the first time the electric chair will be used in Tennessee since lawmakers brought it back four years ago. I wonder if things might be different if the governor had come to Friday prayers at Riverbend. Some of the men he would have met are fully transparent about what they did to land them on death row, many of them confessing that, before they found Christ, they felt they had no reason to live after what they had done. Many of them have worked hard to heal the wounds they were responsible for. I know the governor would have a hard time executing these men if he were ever to meet them. Some of the men there at Riverbend maintain their innocence, which is entirely believable given the current track record when it comes to executions in America. For every nine executions, one person is released from death row after proof of wrongful conviction. Among them was Ndume Olatushani, who was convicted of a murder in Tennessee even though he had never even been to the state. The first time he came to Tennessee was to defend himself in court against a crime he had nothing to do with. It took him more than 20 years to prove his innocence. Many of the men at Riverbend remember Ndume well and refer to him as a source of hope that maybe they too will be able to prove their innocence. Since that first visit a few years ago, I’ve seen these men on death row grow in their faith. I’ve sung hymns with them, prayed with them, laughed and cried with them. I’ve taken my mom and wife to visit Unit 2, and many of my friends. I got to be there when one of the men was ordained as a minister. His first act after ordination was to serve us all communion there on death row. The thought that this young minister could soon be executed, and at the hands of a fellow Christian governor, breaks my heart and keeps me up at night. I think of the assembly line of executions in Arkansas last year, where four inmates were put to death in eight days — and where state officials had originally planned eight executions in 11 days, beginning right after Easter. If they believe that “while we were yet sinners” Jesus died to save us from death, should they in turn be willing to offer mercy to others — and to pray that they will experience redemption? The fact is, the death penalty wouldn’t stand a chance in America if it weren’t for Christians. The Bible belt has become a death belt in America. Since 1982, Texas — often called buckle of the Bible belt — has executed 555 people. This year, of the 19 people executed in the United States, 10 were put to death by that state. Three more are scheduled by the end of the year and three more are already set for 2019, according to the Texas Department of Criminal Justice. It is time for Christians to rise up, stand on the side of life, and call for an end to the death penalty. Unfortunately, many of my fellow white evangelicals haven’t spoken out. Now is the time for them to do so. We need Christian pastors, musicians and authors and all citizens of faith to use their platforms to stand up for life when it comes to capital punishment. We need more pro-life Christians of all stripes — Protestant and Catholic, evangelical and mainline, charismatic and liturgical, Republican and Democrat, old and young — to take a stand right now. When Christians decide that capital punishment is incompatible with the gospel of grace and redemption, the death penalty will die in America. If Christians around the world stay faithful to Jesus, we will see the end of the death penalty in our generation. After all, when it comes to executing our own citizens, the United States along with China, Iran, Iraq, Yemen, and Saudi Arabia are still leading the way. Let us end the death penalty. And let us do it in the name of the executed and risen Savior, Jesus. Article originally publisehd by Morning Star News. Used with permission.